This is a fine and original 37mm. 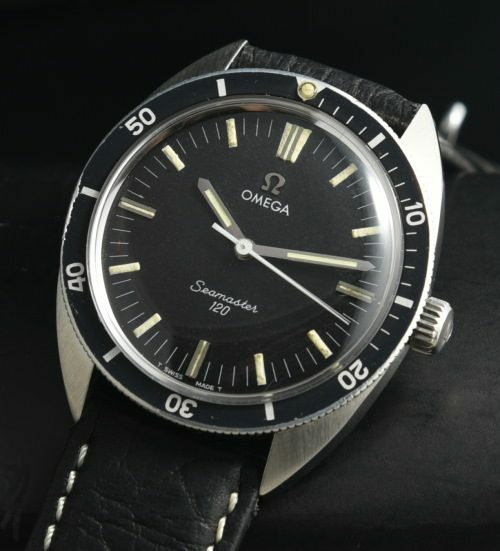 OMEGA SEAMASTER 120 dating to 1969. The steel case display excellent condition overall. The caliber 601 OMEGA manual winding movement-just cleaned and accurate. The original dial and hand set look fabulous. The hesalite crystal is correct Omega. The OMEGA crown is correct. The bezel is original with only some minor wear in the paint near 9:00. These watch have been steadily increasing in value lately. $2250.